Mexico City, 2009: Two decades after abandoning the metropolis, Meche returns for her estranged father's funeral. It's hard enough to cope with her family, but then she runs into Sebastian, reviving memories from her childhood she thought she buried a long time ago. What really happened back then? What precipitated the bitter falling out with her father? Is there any magic left? I knew absolutely nothing about Signal to Noise until I was lucky enough to win a giveaway on Twitter which led to SciFiNow sending me a box full of SFF books. One of those books just happened to be Signal to Noise. If the cover isn't enough to spark your interest then the blurb certainly should be. A teenager casting spells using music in the '80s? Yes please! I didn't know how much I wanted to read a story about that until I was holding it in my hand. Add to that the setting of Mexico City and I'm a happy bunny, because I've been trying to read more books set outside the UK and the USA. If you're looking for a book all about magic and how it works then this probably isn't the book for you; Signal to Noise is much more along the lines of magical realism than urban fantasy, which basically means that it's our world, with teenagers who've discovered magic, and you just have to suspend your belief and accept it. I really loved the concept of magic Moreno-Garcia created; as much as this book doesn't dedicate pages and pages to how the magic works you aren't left completely in the dark either. We discover how it works at the same time Meche discovers it, because while she might be able to wield magic that doesn't make her an expert over night. Signal to Noise is instead a lot more focused on the repercussions of magic, and how it might really be used if a bunch of confused teenagers discovered it. Moreno-Garcia handled this aspect of the novel so well. I really believed the characters she created; Meche, Sebastian and Daniela are divine and raw and real, and when I finally closed this book I was disappointed that their story was over. Meche and Sebastian's relationship in particular was exquisite. Though there were times in the novel when I grew frustrated with them I never disliked them, because everything they do is understandable even when it isn't excusable. It would be foolish of me not to also mention the music, which is a constant throughout this book. I wouldn't consider myself particularly knowledgeable when it comes to music - unless it's a Disney soundtrack, in which case I probably know too much. In fact as much I love music I know nothing about music genres; music aficionados out there would wince at my complete inability to tell the difference between punk and rock. Genres have just never really mattered to me, I guess - if I like a song then I'll listen to it, regardless of what it is. I do love people who love music, though; people who love it so much that they can't go a day without listening to it, who know everything about music genres and the history of music and who love to talk about it. 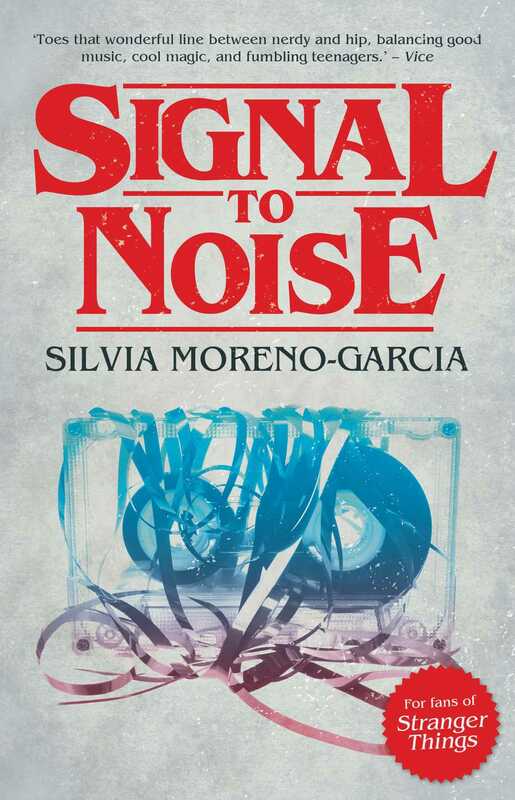 So as you can imagine Signal to Noise was a lot of fun for me to read, because Meche practically lives for music. Honestly I wish I'd been as knowledgeable as her when I was 15. If you're a music lover, then you definitely need to read this book. If you can't already tell I fell head over heels in love with this book. I love it when books surprise me, when I come across a book I've never even heard of before and then love it, and I'll definitely be adding this book to my favourites list.